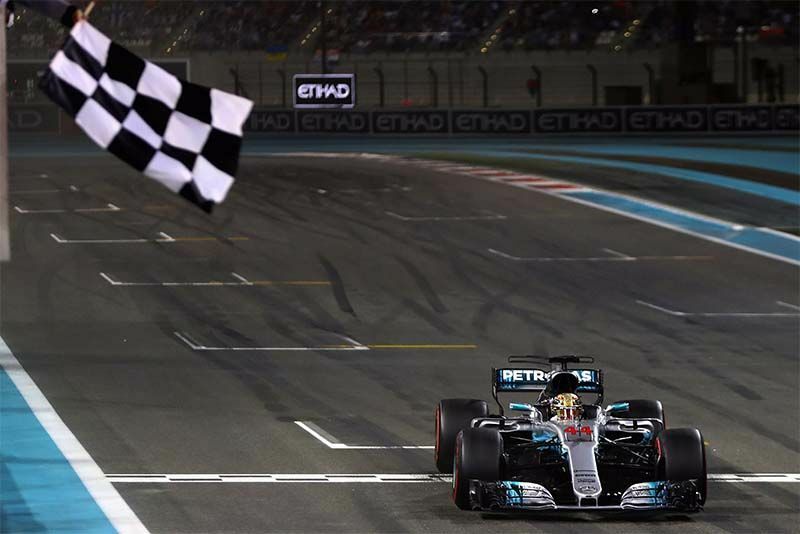 Lewis Hamilton dominated the Abu Dhabi Grand Prix, winning the final race of another title-winning season, while Nico Hulkenberg ended upside down on the first lap, and Will Smith makes an appearance. Hamilton used pole position to his advantage, leading the pack into the first corner of the final race of the season. The race was yellow flagged halfway through the lap though, when Hulkenburg came into contact with Romain Grosjean after a tussle going from turn 9 into turn 10. The contact put the Renault into a roll, coming to rest upside down against the outside barrier. The car caught fire briefly and a scared-sounding Hulkenberg radioed to the team: "I'm hanging here like a cow. Get me out. There's fire." Once the fire was extinguished and the car righted, he climbed out, uninjured, by himself. Hamilton maintained the lead after the restart on lap 4 with teammate Valtteri Bottas in second. On lap seven, Kimi Raikkonen's Ferrari switched off exiting the final corner, coming to a stop on the finish line. As the virtual safety car was deployed, Mercedes called Hamilton into the pits, sparking the longest second stint of any driver. Ferrari's Sebastian Vettel held off the charging Red Bulls to claim second while Max Verstappen and Daniel Ricciardo claimed third and fourth respectively. Fernando Alonso finished 11th on what is likely his final drive in F1 as the Spaniard will not be racing for McLaren next season. After the chequered flag, and in a glorious display of tyre-shredding respect, Hamilton, Vettel and Alonso did doughnuts for the fans in tribute to Fernando. The Formula 1 YouTube channel also pays tribute to Alonso, which you can watch here. That wasn't the end of the tributes as Hamilton and Vettel swapped helmets, with Hamilton saying: "This is kind of an honorary thing that drivers do, this is the highest regard of respect that we can have as drivers. "This is like our jerseys. So here's one of mine, great job this year, and it's a real pleasure racing against you." According to Vettel, he had been "really looking forward" to swapping with Hamilton as they'd never done that before. "Well done to you," he said, "Five championships, that is a great achievement. I hope I stop you from any more!" Hamilton then had a light-hearted dig at the German, saying that he will "never be able to actually use it" because Vettel "has a small head". Actor, Will Smith, was also at the race to tick off a few bucket list items in celebration of his 50th Birthday. One of them being 'kidnapping' Hamilton so he can race the champions' Mercedes. He also manned a camera and waved the chequered flag among other things. It clearly pays to be famous. Video: Could The Renault Ez–go Overtake Uber?